The World Cup 2018 has just finished, we can not deny the talent of the Croatia soccer team. Are you curious about this country? Are you going to travel to Croatia? What are the inescapable attractions and what to do there? If you want to explore the country of “Checkered Jerseys”, it’s time to plan a tour to Croatia right now! The information below will give you an overview of Croatia to make the right decision for your trip. Let’s start! So just keep in mind some necessary things about Croatia and you will enjoy your stay in this beautiful country. 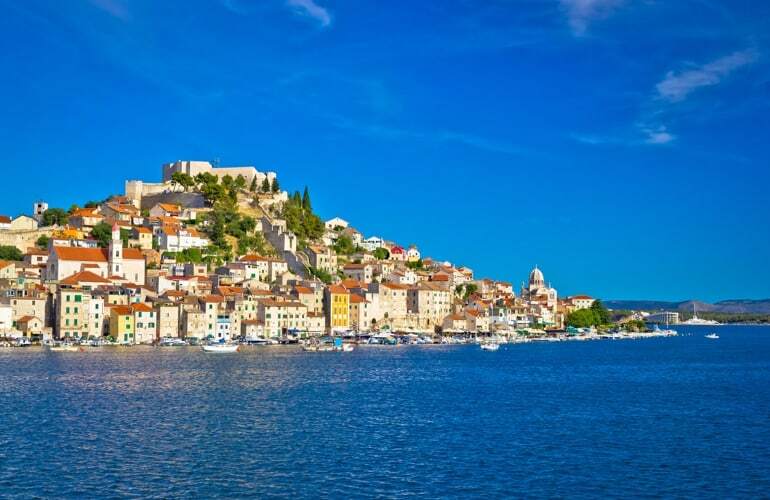 Croatia is actually surrounded by the Mediterranean Sea, between the Balkans and Central Europe. It has a rich culture and fascinating history. Moreover, the natural scenery here is also extremely majestic. With its unique cultural and natural features, it will definitely be a memorable and unforgettable experience. Rovinj is a small town of the western coast of Istria. This town is surrounded by 22 different large and small islands. Besides that, it is recognized as a cultural relics in 1963. With the pristine beauty of the ports and dense forests, Rovinj is absolutely a worthy visit city. In fact, the old town with narrow streets, paved with stones is famous for its simple and quiet life. It represents the elegance and warmth of the Mediterranean. 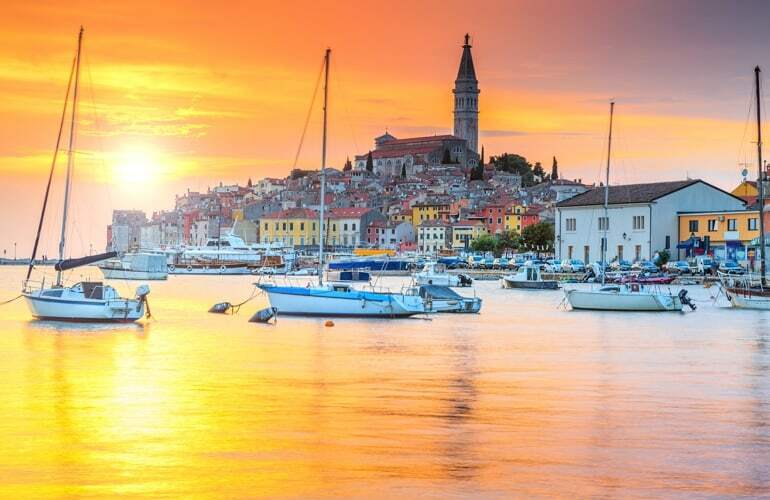 Rovinj will seduce you with its wealth of the forest, nature, marine life, natural wonders and cosy old town. This is a historical city of Croatia, located in the center of Dalmatia, where the Krka River flows into the Adriatic Sea. Sibenik is an important educational, transportation, touristic and political center of Sibenik-Knin. Indeed, it is famous for its four giant fortresses, unique walls, natural deep seaports, and romantic beaches, medieval churches and aristocratic palaces. Therefore, it will be an ideal destination if you decide to travel to Croatia! 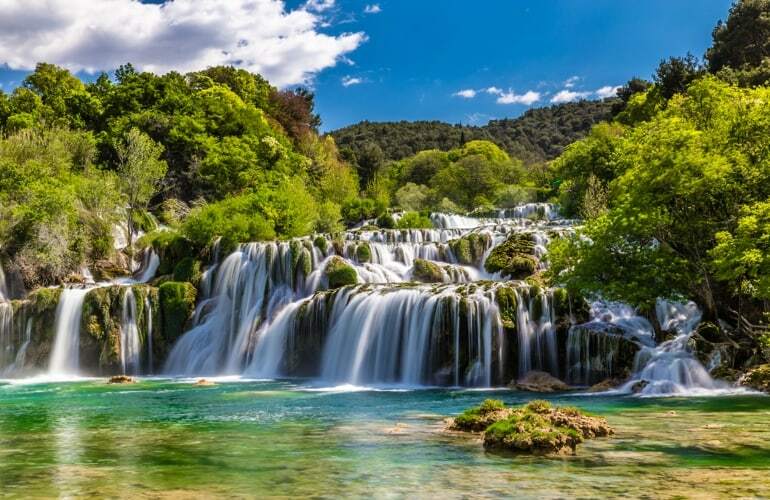 Skradinski buk waterfall in Krka National Park is where you can soak up the cool water and enjoy the peaceful mountainous environment. Skradinski buk is the longest and most popular waterfall in Lozovac. This is one of the most famous natural wonders of Croatia as well. The Skradinski boulder area consists of 17 different small cascades, distributed along the length of 800m. The distance between the waterfalls from 200m to 400m with a total difference of 45m. Under the massive waterfall there is a beautiful natural swimming pool, you can enjoy swimming and soaking. Then, the lush yellow limestone hides under the blue water, formed from the merging of the waters of the Krka River with the Čikola River, is a very special place in Krka National Park. The whitewashed waterfalls, surrounded by lush vegetation, are the factors that make Skradinski waterfall the most unique and beautiful in Croatia. Having 1700 years old, Split is not only one of the oldest cities but also the second largest city of Croatia and the largest of Dalmatia. It is a city in Central Dalmatia, located on the eastern coast of the Adriatic Sea, centered on the Roman Emperor Diocletian's palace. 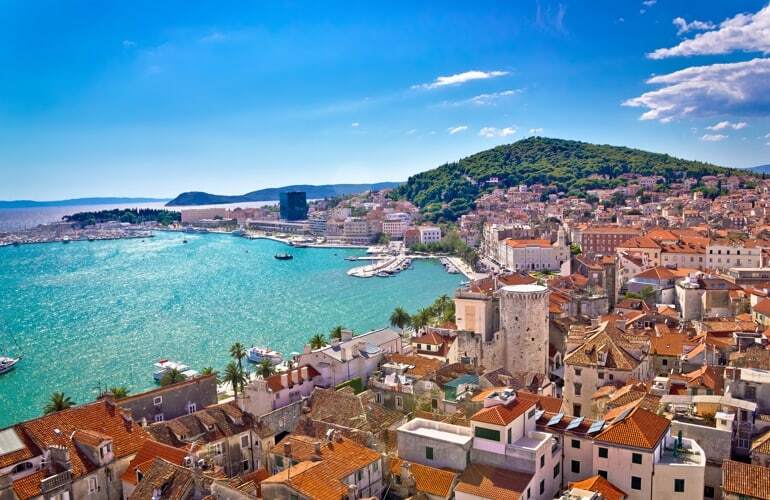 Split is a popular tourist destination which has the historic center with its Roman walls and ancient square and as an inter-regional traffic hub. Here you can easily visit many islands and attractive peninsulas such as Adriatic and Apennine. We can say that Split displays a great number of graceful and special Mediterranean flowers. Always attract tourists to travel to Croatia by the beauty of their own that few cities have similar points. 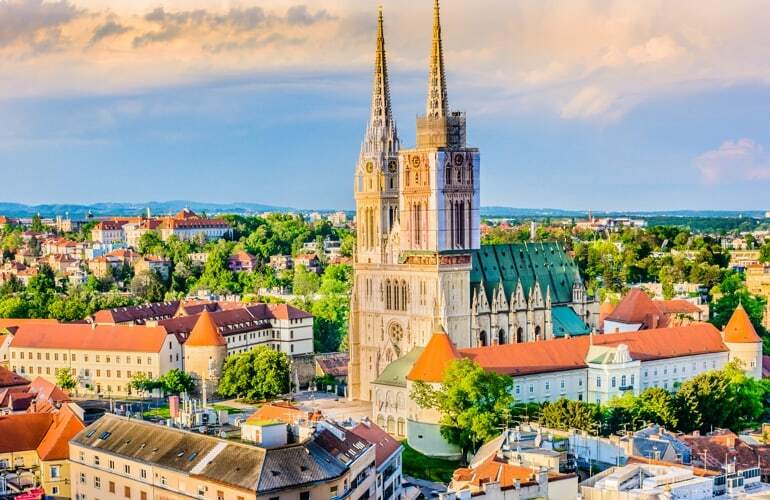 Situated on the peaceful Sava River, Zagreb is the largest city and capital of Croatia. In this city you will admire architectural works dating back to the Middle Ages. Then, you will also be enchanted by the large number of works of art in every corner of the city. You can discover the city by visiting legendary Mirogoj cemetery; the green space with the lawns and artificial lake of the largest park of Zagreb, Maksimir; weird and stunning museum of Broken Relationships or go to buy local products at the largest market in this city - Dolac. Zagreb is gentle and quiet, which will definitely make you fall in love with its unique atmosphere. 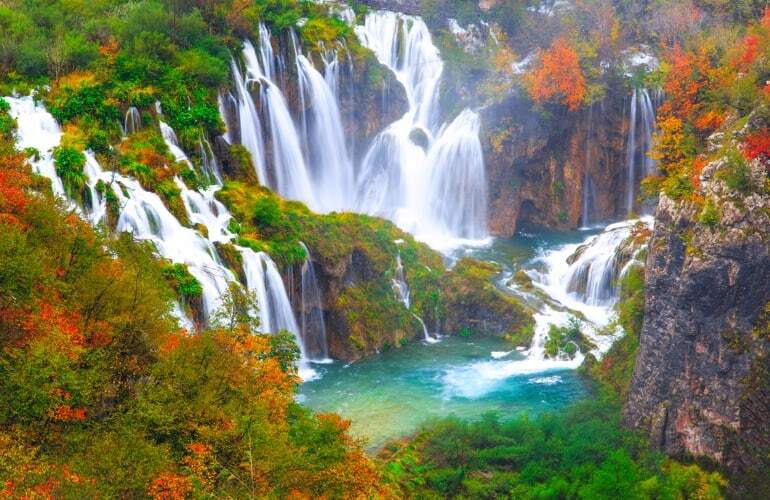 Plitvice Lakes National Park is an amazing destination if you travel to Croatia . It was established in 1949, located in Plitvice Lakes, in the mountainous area of Lika. This is a purely atmospheric national park and one of the most beautiful natural landscapes in Europe with a system of 16 lanes interconnected by an immense forest. The lake system in the Plitvice Lakes National Park was formed thousands years ago from rivers in the southwestern European Basin. The 16 lakes are divided into two clusters, 12 of which are on the top and the other 4 on the bottom. They are forming streams and downstream waterfalls, gradually decreasing from the height of 636m to 503m stretching about 8 km in the north - south direction. Next, the vegetation is quite rich, with plant characteristics mixed between the Alpe Mountains and the Mediterranean. The national park is also home to many endemic species such as brown bears, wolves, eagles, owls and about 160 species of rare birds. 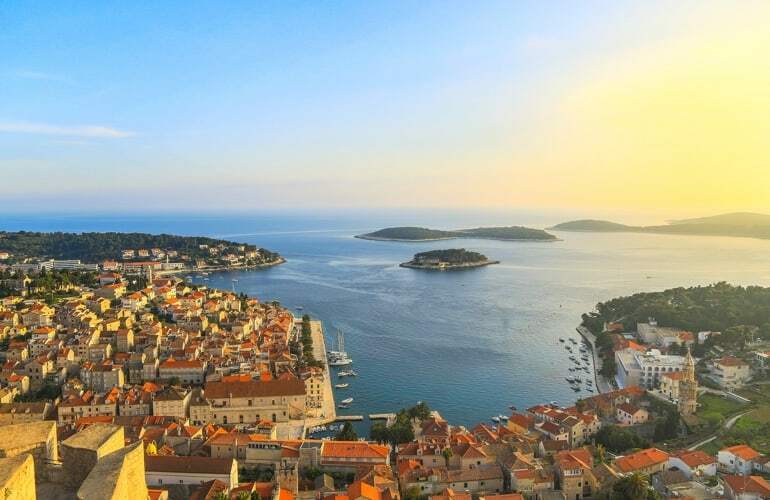 Croatia's most famous rural landscape with numerous olive groves, orchards, massive lavender fields, Hvar Island and the town of Hvar are probably the perfect destinations for those looking for Peace and romance. In fact, you will be immersed in the vast nature when sailing around the Adriatic-picturesque nature bay in the heart of the town of Hvar. Moreover, it's amazing when wandering around the lush purple lavender fields or strolling around Starigrad and Jelsa. There are also numerous ancient villages on the island and some small picturesque villages nestled in the mountains. 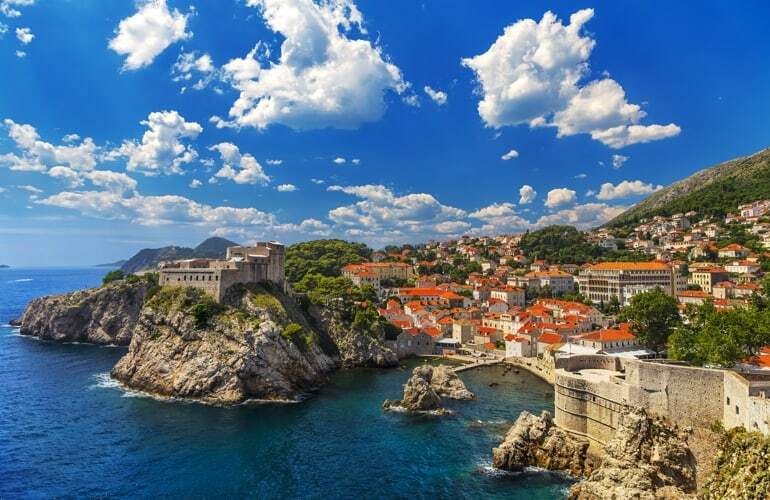 Called the "Pearl of the Adriatic," the tourist city of Dubrovnik is a must-see place when traveling to Croatia. You can easily see the splendor of the 8th century building and the old red roofs. In the Middle Ages, Dubrovnik and Venice were the two most developed commercial centers in the Mediterranean. Adopting a variety of cultures through trade, Dubrovnik has many beautiful architectural and sculptural landscapes. Thus, you can find it through the churches, monasteries, famous walls surrounding the ancient city, mixed with many architectural styles from Rome to Morocco.